In the busyness of the season before Christmas and holiday celebrations, we can get so lost in the preparations that we lose our focus and feel like the joy of the occasion is lost, and we feel like we’ve been run over by the holiday. Once again, I am offering Advent Musical Devotions delivered to your email box to help you take a few moments to breathe and recenter. in my journeys across the nation and world, and within my own heart. May you be blessed this Advent season of preparation, so that you may be a blessing to others. “Hi, this is Steve Eulberg with another Habit for Your…. For people who are developing their Habits for a Healthy Music Habitat. My patrons, on Patreon, have been able to support me so that I can finish this collection in a digitized fashion. Southern Harmony shape-note tunes arranged for Mountain Dulcimer Trios. And what I’m excited about is they were able to do that, and THAT let’s me get to work on the NEXT one, which is shape-note Fuguing tunes, from the Sacred Harp collection. As a way of just thanking patrons and inviting YOU to be one of those patrons also, I want to give you a chance to get your name into the THANK-YOU PAGE of the digital book! Of THIS one…AND…the NEXT ONE. This is a special offer that only lasts until the end of September and I want YOU to have the chance to get in on it. Each of us loves to have a trusted and reliable location to learn of the things going on that are important in our universe. For many years EverythingDulcimer.com was that place. We have been hosting Live Events at DulcimerCrossing.com as a benefit for our Basic and Premium Subscribers. We have added a Dulcimer Events Page to our website (see the 6th tab from the left at the top). Our vision is to provide as complete a list of dulcimer events as possible – including not just festivals, but also workshops and concerts by dulcimer artists. You can sort this database and look over upcoming events according to the start date, type of event, name of event, location, city, and state. Just click on the column title to reorganize the information. Please feel free to let us know about your upcoming event by using the Dulcimer Event Information Form. And always keep an eye on our Live Events Calendar, for upcoming concerts sponsored by Dulcimer Crossing. DulcimerCrossing.com will be presenting a FREE concert for all Premium Members streaming live via Concert Window. Sam Edelston is an entertainer with many facets. In recent years, he has been pushing the creative boundaries of the mountain dulcimer. He also performs on guitar, banjo, and occasionally hammered dulcimer, and sings. He does songs that span the rock & roll era and decades before that, plus folk, original songs, funny songs, shout-alongs, and more. Sam Edelston is on a mission to make dulcimers as widely known as flutes and fiddles. 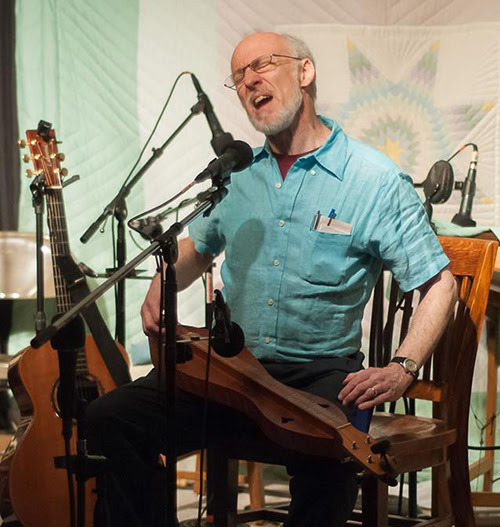 His videos have been viewed half a million times, including his performance of Led Zeppelin’s Whole Lotta Love, which is one of YouTube’s most watched mountain dulcimer videos. Sam likes to show how much a mountain dulcimer can do beyond its folk roots, so expect to hear some “old standards,” pop, rock, country, maybe some originals, and a few surprises – including many songs that he hasn’t previously posted online. For more information about Sam, visit www.SamTheMusicMan.com. Join Dulcimer Crossing as a Premium Member to receive the link!